The Nissan Micra is not a car that first comes to mind when you think of a premium hatchback, although it is a fairly fuel efficient and capable car, especially the diesel Micra. However, with the increase in diesel prices and the expected turn in demand back to petrol cars, Nissan is looking to grab more market share in India. The base petrol Micra XE is powered by a 1198 cc, three-cylinder petrol engine putting out 75 bhp of power and 104 Nm of torque, with a five-speed manual transmission. It is quite barebones as it is, so it’s unclear what features will be knocked off to make for an even cheaper variant. The price is expected to be hacked by about Rs. 70,000, which would put the base Micra at just over Rs. 3.5 lakh, bang in the middle of Maruti Wagon-R territory, undercutting the Chevrolet Beat, Ford Figo and Honda Brio, which are its traditional rivals. 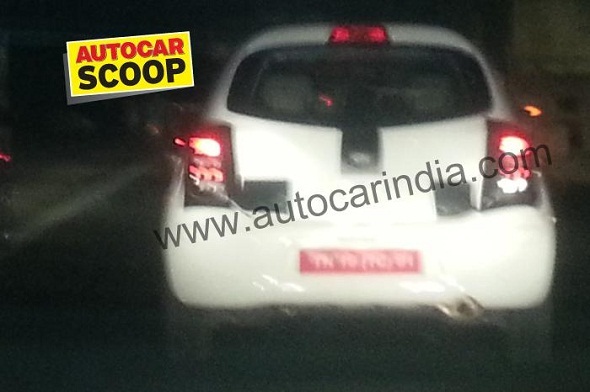 From the scoop picture published, only the tail-lamps appear to be different. It still has body-colored bumpers, which is a good thing. On the interiors, the seat headrest design may be altered, opting for a cheaper single piece seat. It won’t have any airbags (the current Micra offers a driver’s airbag on all variants). It will hopefully have manual air-conditioning and power steering retained, as these are essentials for a car in its segment (Toyota does not offer power steering with the base Toyota Etios Liva).